Classic Aussie tale becomes feature film: Storm Boy by Colin Thiele. Have you ever read a book whilst travelling/on holiday that had such an impact that you remember exactly where you were when you read it? 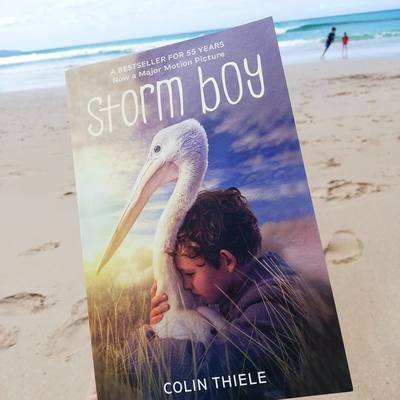 This weekend in Apollo Bay, I read Storm Boy by Colin Thiele. I'm pretty sure I won't forget where I read this tale in a hurry. At this exact spot..
Storm Boy is an Australian book, celebrating 55 years in print this year. Unless you've been living under a rock, you will also know this story is now an Australian drama film based on the novel of the same name. Some of you may have grown up with Storm Boy, I chatted to the owner of the Airbnb we were staying at in Apollo Bay, who said she'd studied the book in primary school. Anyway, first time I've read the book. It's beautiful. The emotional story of a "lost" young boy who raises and befriends a Pelican; Mr. Percival. Regardless it's a engaging story and such a wonderful Aussie tale to read in such a magnificent part of Victoria; the Great Ocean Road. I'm yet to catch Storm Boy the movie, but it is certainly on my watch-list now. Storm Boy is available from all good book stores, published by New Holland Publishers. RRP $14.99. It is an easy read, but I would suggest best suited to children over the age of 10yrs. Storm Boy is also available in illustrated form for younger children accompanied with a plush toy pelican. Which fashion fads of the past do you love to hate?